What makes a life-long Francophile and perfume lover, with fantasies of living in the Loire Valley, sit up and take notice? A fragrance entitled Vie de Château…commissioned by a modern-day count no less — the Comte de Cheverny. Perfumer Patricia de Nicolaï’s aromatic take on aristocratic country living contains notes of: grapefruit, hay, tobacco, patchouli, musk, fern, cut grass, oak moss, vetiver, and leather. Vie de Château starts off powerful and sweet with notes of grapefruit (think grapefruit lollipops), hay, and to a lesser extent, dried tobacco leaf. It has a “blonde,” sugary, sunny feel. A clean patchouli and minimalist musk are the next notes to appear (within five minutes of application) and they do little to lessen the fruity sweetness of Vie de Château. I do not find the ‘greens’ at all noticeable in this perfume — fern, oak moss, grass and vetiver are barely there. The leather is not apparent either, but Vie de Château is a great layering scent — add your own spice, leather or black tea fragrances to it for added dimension and variety. This delicious, summery eau fraîche is gender neutral and the lasting power is very good. Life at de Nicolaï’s château is bright, generous, calm, comfortable and…traditional. I’m buying a bottle for summer. I’ll give myself a liberal spray of Vie de Château and regard, with count-like disdain, the weeds, peeling paint and slugs of my own dominion — far from the Loire Valley, alas! 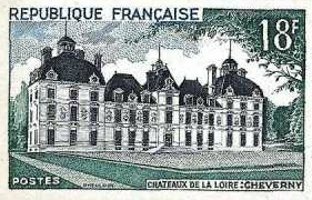 Note: image via Groupement Philatélique Régional Centre - Loire. This sounds wonderful, thank you so much for the reveiw! Well, I'm both of those creatures you mention, a francophile and perfume lover, but it was no go for me with this one. When Parfums de Nicolai are good, they're very, very good. When they are bad, they are horrid. And, having spent part of October in the Loire Valley, I was REALLY looking forward to liking this! Did you know that the Prince Jardinier (I think that's the name) perfumes are made by someone in the Loire Valley, though? Oh dear, about the LL! I've only tried the rose one, l'Eau du Prince Jardinier and Ciel, Mon Jardin. They're all very nice. I bought the first one for my husband as a kind of memento of the Loire Valley. They're not groundbreaking scents or anything, but very pleasant. Well, 'horrid' is probably too strong a word. But I had a similar strong dislike to Cologne Sologne and the other one like it (Cologne Nature or something?) There's a soapiness to some PdNs that I really don't like—without that element, they'd be wonderful, imho. Eclipse is one of my all-time favorites, though, and it is a PdN. I mean, I bought l'Eau du Prince J for my husband, not the rose one. Hey, R, I just bought a bottle of this and I love it (so far, anyway)! On me, the grapefruit doesn't last long, and I don't really get fruity sweetness at all; I get mostly hay and leather. Very dry on my skin. Go figure. I love the way it makes me feel like I'm lying in the middle of a dry, grassy meadow on a hot August day. I suppose my horse should be tethered to a giant oak nearby, too. So sorry, I wasn't paying attention. My apologies! Its not horrid, its just a light scent, but on my skin, it was actually a light, charming scent that is unprovocative, but not horrid. Kevin, can you suggest anything I could layer it with ? Thanks ! PolarBear2: I layered it with Guerlain or Givenchy Vetiver. Vetiver cuts the sweetness. Great ! Will try that. I have Vetiver. Thanks ! Oh my gosh, I’m dying to try this one. I think I’m just going to bite the bullet and buy unsniffed during the BH sale!